ANC now offers you the opportunity to obtain a globally recognized aviation & aeronautic science qualification from LeTourneau University,Texas. 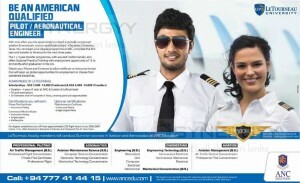 You can begin your degree programme at ANC, complete the first year and transfer to America for the next three years. The 1 + 3 year transfer programme, with assured credits transfer, also offers Optional Practical Training with employment opportunity of 12 to 29 months after graduation in the U.S. Obtain your Private and Commercial pilot certificate or Instructor license that will open up global opportunities for employment or choose from combined disciplines. On degree completion you will have approximately 220 flight hours in our 2006/2007 Cesna 172s/2005 American Champion Citabrias and Diamond DA-42 Twin Stars. Programs) in Sri Lankan university. and house as security to a bank, but it was not successful. feel my ambition and my future. I thank you for your kind co-operation in this matter.